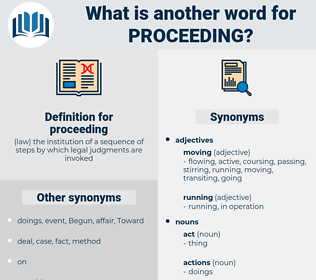 What is another word for proceeding? protocols, Agencies, Measures, rules, assess, procedural. meetings, progress, continue, pleading, course, conducting, treatment, undertaking, diligence, operandi, prosecute, handling, continuing, ongoing, pursuing, exercise, operation, matter, decision-maker, dispute, pursuit, moving. Progressing, Prosecuting, Commenced, Commencing, departing, pressing, advancing, Furthering, Embarking, Undergoing, complete, completing, Considering, Disposing, operating, persisting, relocating, developing, Resuming, stopping, convening, Occurring, endeavouring, performing, investigating, deciding, preserving, Carrying, existing, development, Celebrating, Perpetrating, Introducing, appearing, authorising, core, reaffirming, organising, evaluating, Originating, expanding, Authorizing, upgrading, Adopting, resolving, before, open, opening, Facilitating, Providing, waiting, Addressing, Mainstreaming, arriving, directing, Elaborating, coming, Stepping, approaching, communicating, curing, arranging, circulating, emerging, Sustaining, Awaiting, Litigating, spend, Generalizing, entering, Committing, Permitting, Delivering, collecting, Commending, Organizing, Evolving, Surrendering, sending, remaining, exercising, Examining, flying, Pertaining, Choosing, Behaving, select, Selecting, Formulating, welcoming, happening, unfolding, Employing, accepting, posing, striving, Resorting, Discussing, crossing, Strolling, pushing, incurring, regards, dosing, Everything, Treating, spreading, Suing, driving, retaining, attending, Placing, judging, Amending, Referring, Transforming, leaving, globalizing, Arising, agreeing, settling, wearing, dealing, calculating, Cruising, reaching, Discharging, Affirming, Submitting, browsing, monitor, Emanating, becoming, drawing, traveling, walking, offering, insert, Extending, issuing, Applying, guiding, reviewing, Effecting, pursuant, rising, bearing, Transferring, Staying, leading, Relying, using, Channelling, Realizing, heading, being, Instituting, switching, designing, marching, exiting, identifying, Stemming, setting, jumping, joining, Achieving, causing, facing, assuming, questioning, teaching, Granting, Fulfilling, tackling, turning, agenda, keeping, landing, yielding, functioning, Establishing, targeting, building, playing, Attaining, laying, putting, Doing, looking, transiting, ranging, Attempting, resulting, bring, bringing, Aiming, boot, Booting, surfing, counting, seeing, allow, Allowing, raging, surveying, train, shifting, focusing, Amounting, talking, saying, Having, base, getting, progress, pleading, course, conducting, treatment, undertaking, handling, continuing, ongoing, pursuing, moving. procedure, continuation, move, process, procedural. Producing, Responding, implementing, Navigating, going, working, Maintaining, sailing, seeking, visiting, procedure. immobility, deliberation, endurance, quiet, suffering, rest, quiescence, suspension, passion. inaction, idleness, inactivity, stoppage, cessation, inertia.
" Now, Kate," said he again, with his arm round her, as she stood by him, " will you tell me what led you to this very sad and strange proceeding?" Like a shot he was across the stones, now alive to the meaning of the strange proceeding.